This website aims to chronicle the history of Chrishall, a village in the top west corner of Essex, East Anglia, UK. Chrishall (pronounced Chris hall) is a small village in the English county of Essex. It is located 20 kilometres (12 mi) south of Cambridge and lies equidistant [10 kilometres (6 mi)] between the two medieval market towns of Saffron Walden and Royston. 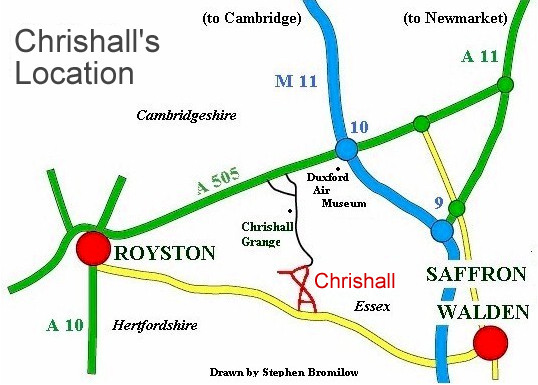 Although in Essex, Chrishall lies close to its borders with Hertfordshire and Cambridgeshire and has a ‘Hertfordshire’ postcode (SG8). The village was listed in the Domesday Book as Cristeshalla, or “nook of land dedicated to Christ”. In 1422, (1 Henry VI), it appears in a record as “Cristeshale”. It is one of only two English settlements whose name contains the word “Christ”. Chrishall’s location is key to its character; as the village sits at the highest point in Essex, at 147 metres (482 ft) above sea level, road construction has avoided this high ground and therefore Chrishall is off the beaten track. Despite its relative isolation the village retains facilities such as a pre-school as well as an infant and junior school. The village also boasts a sports field, childrens playground, church, many clubs and societies as well as the Red Cow public house. ‘How to pronounce Chrishall’ – that ages old debate again. I can hear Mrs Irene Cranwell trying to put people straight: “Now, my dear, Chris-hall, two separate words, definitely ‘yes’. Great Chishill is not pronounced Great Chish-ill and locals and long time residents even from other villages seem to know what’s what. Where’s the difficulty? Mrs Cranwell and her lovely daughter Susan Davies would have soon finalised the debate once and for all. Fascinating Facts about the village: view the slideshow here. Many houses in Chrishall have house names but no numbers. The following notes on the village’s streets give visitors simple directions to locate individual addresses. It is best to think of the centre of the village as the cross roads at the small triangular green where the war memorial and the village sign are located and to picture each road leading from this centre. Immediately opposite and to the south of the war memorial is Loveday Close, a small development of attractive, modern houses. North -east from here runs Crawley End – a long road (which passes through what may seem almost a separate settlement) and which eventually leads past the turn to Elmdon. Half way along this road is Wire Farm, itself surrounded by open fields. Chrishall Methodist Chapel is located here, being the first building on the left (north side) after the open fields. At the far end are (former) council houses and on your right hand side as you leave the village are two culs de sac: Engleric and Pinkeneys. North -west from the centre runs Palmer’s Lane, leading to Abrams Lane. The village school, community centre and playing fields are accessed from Palmer’s Lane near the centre. A few hundred yards on the left where palmer’s Lane becomes Abrams Lane is Broad Green – a cul de sac lane. South -west from the centre runs the High Street. Our ancient pub The Red Cow is here at the junction with the very narrow Hogs Lane (sometimes called Red Cow Lane), as is our volunteer run Village Shop. Down the High Street on the left hand side is Brick Row, a long terrace of houses dating from the middle of the 18th century. The High Street continues down to the main Saffron Walden – Royston road (B1039) but before that a small lane called Chalky Lane links across to Church Lane. Church Lane runs south-east from the centre and unsurprisingly, the Holy Trinity Church is accessed from it just before it too, reaches the B1039. Finally, a few houses are located on Mill Causeway. This road leads up from the far end of Abrams Lane to the far end of Crawley End, just before the Elmdon turn. 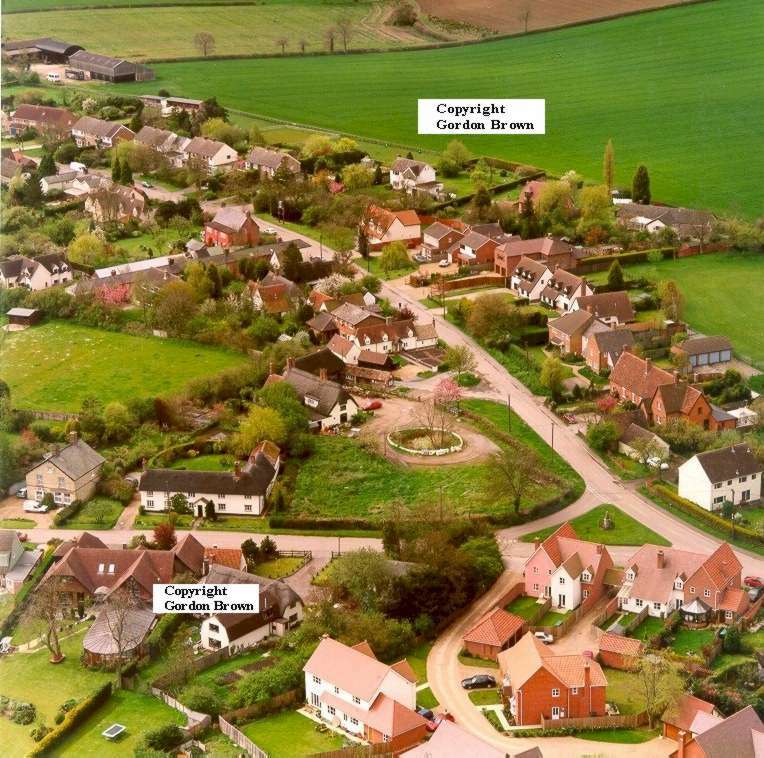 The photograph above shows the centre of the village and looking towards High Street and Church Road. The new estate that can be seen bottom left has been built on the old bus depot which you can read about here. Stanmore Place, the house on the very left of the picture in the centre used to be the village post office at one time and is mentioned in Joy Loveday’s memories of the village. Chalky Lane is also referred to as White Lane. The single track road down from The Red Cow is called Hoggs Lane. Lower Church Road is known as Bury Lane. Lower High Street is known as Hollow Road, well named as the road is sunk between high grass banks that recede as you get to Chalky Lane and then up into High Street itself. The top of Crawley End heading towards Mill Causeway is known as Petts Corner. Land that was part of Parsonage Farm, as you face the farm entrance, and now built on by former council houses was known as Moores. Apparently it was very boggy marshy land and referred to locally as The Moor. Mill Causeway did have a windmill at one time – hence it’s name – but was often known locally as ‘The Castey’ and it is relatively recently that the road was continued down the hill to meet Abram’s Lane at the corner. Click here for House Name Index.